BI4Dynamics – run your entire business through one fully integrated Business Intelligence solution. Sales Values: analyse where sales and profit are generated (Gross/Net Sales, Costs, Discounts, Profits, Charges, Averages, date comparisons, Last transactions) from standard invoiced transactions as well as from specific NAV information like Expected values (Net Sales, Profit, Cost), Non-Adjusted values (Cost, Profit) or Original Profit from original document. Sales Order History: a daily snapshot of live Sales documents (T36 and T37) is saved into a snapshot database (a part of DW) and kept “forever”. Analyze Sale documents history long after documents have been changed, posted or deleted by any measure that you would expect or need. Very useful for companies with long delivery cycles. Sales Budgets: compare sales budget and actuals (Net Sales, Qty and Cost) with variances and date comparisons. Sales Delivery: track your company delivery performance toward your customers by following measures On-Time or Late (Days / Amount / Qty / Lines) by four different dates (Planned Delivery, Planned Shipment, Promised Delivery, Requested Delivery). Sales Quantities: analyze Quantities and verify that all that has been shipped is also invoiced in a straightforward measure (Shipped/Invoiced Variance=0). Measure groups are sharing 38 dimensions with 476 attributes in 71 hierarchies. 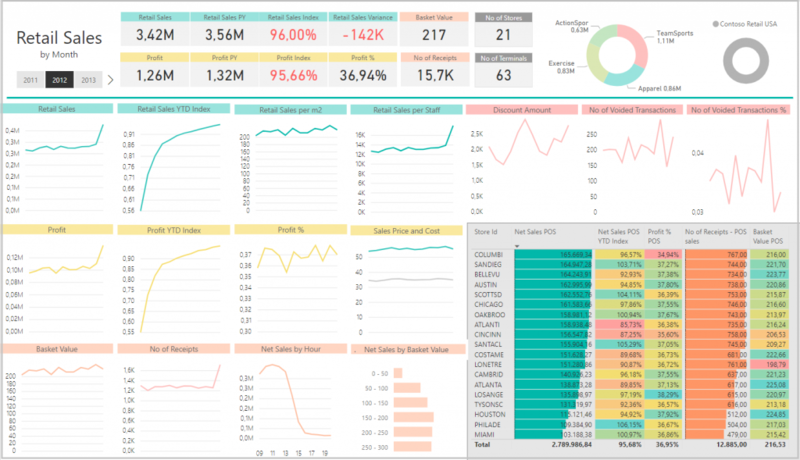 Click on the picture below to open a live Power BI report. It might take a while to load. Receivable Analysis: analyze balances (Average Due / Open / Overdue day – these measures calculated as weighted averages). Balances are calculated daily for every open document, with the option to compress on a weekly or monthly level for prior periods (to gain performance and save disk space). Customer Analysis: get insight into customer transactions (with standard Debit, Credit, Net change and Payment terms also as weighted average, as well as some specific measures Sales on Credit as amount and percentage). Measure groups are sharing 18 dimensions with 227 attributes in 34 hierarchies. General Ledger: analyze transactions and balances. General Ledger Budget: analyse budget and budget variances. Account Schedules: use NAV reports from Account Schedules where by combining any standard BI and global dimension user gets unimaginative flexibility for financial reporting in Excel or Power BI. Measure groups are sharing 28 dimensions with 215 attributes in 33 hierarchies. Inventory Value: analyze Cost and Quantity (Amount, Increase, Decrease) by Entry type (in multiple variants of measure), Average costs and Expected values (Posted to GL or Inventory Cost). Inventory State: track dynamics of your Inventory (Opening / Closing Qty and Value Balances, Stock Rotation in days, Min / Max Values, Average Qty and Value over time). Inventory Aging: track Ageing value and quantity from first NAV transactions with all changes over time by detailed aging buckets. Measure groups are sharing 21 dimensions with 174 attributes in 16 hierarchies. Purchase Values: analyze the cost of Items, GL postings (services), Charges and Fixed Assets (Cost amount, Discount, Quantity, Price, Last purchase transactions) from standard invoiced transactions as well as from specific NAV information like Cost Amount Expected. Purchase Order History: a daily snapshot of live Purchase documents (T38 and T39) is saved into a snapshot database (a part of DW) and kept “forever”. Analyze Purchase documents history long after documents have been changed, posted or deleted by any measure that you would expect or need. Very useful for companies with long delivery cycles. Purchase Delivery: score vendor performance as the difference in planned date (Exp. Delivery Date or Planned Received Date or Promised Receipt Date or Requested Receipt Date) and actual Receipt date and calculate measures On-Time or Late (Days, Lines, Amount and Qty) as value and %. Purchase Budgets: compare purchase budgets and actuals (Budget Cost and Qty) with variances and date comparisons. Measure groups are sharing 35 dimensions with 429 attributes in 65 hierarchies. Payables State to analyze vendor payment habits (Payment Term / Open / Overdue Days – all measures calculated as weighted averages), Days Payables Outstanding and Payable Coefficient. Balances are calculated daily for every open document, with the option to compress on a weekly or monthly level for prior periods (to gain performance and save disk space). Vendor Analysis” to get insight into vendor transactions with specific measures Purchase on Credit as amount and percentage). Measure groups are sharing 18 dimensions with 225 attributes in 32 hierarchies. Manufacturing: analyze Input, Output, and WIP (work-in-progress) expected and actual values with details “from which input products have been produced” or “where (for which Item) a consumed material has been used”. Manufacturing Expected: information about expected values (before starting Production Order) with measures like Cost, Quantity, Run Time and Setup Time. Capacity Calendar: analyze capacity, actual and variance of Work Centres (people, machines). Measure groups are sharing 19 dimensions with 166 attributes in 21 hierarchies. Job Actual: track Sales (Net, Gross, Discounts, Profits) and Hours with Actual and Expected values with details related to Item, GL, and Resource. Job Planning: compare Scheduled and Contracted measures and compare it with Actuals as absolute or relative numbers (% Complete and % Contracted). Resource Capacity: analyze capacity and utilization of Resource. Measure groups are sharing 20 dimensions with 199 attributes in 33 hierarchies. Retail Sales Transactions: analyze Gross / Net Sales (per Line, M2, Staff, Store, Terminal), Profit and Qty, Basket Value, Store Size, Returns, Tax, and Discounts. Retail Store Information: track Store Area M2 that is used for calculation of averages in other measure groups. Retail Transaction Table: have a more condensed view over retail sales and payments. Measure groups are sharing 32 dimensions with 212 attributes in 38 hierarchies. Copyright © 2018 BI4Dynamics. All Rights Reserved.